Coffee table book featuring the AKC's 170+ dog breeds, purebred and rescued dog of each breed, living in the San Francisco Bay Area. 414 backers pledged $24,099 to help bring this project to life. Hi! I'm Kira Stackhouse, dog photographer from San Francisco. About a year ago, I came up with the idea to make a new kind of awesome dog book - user generated and inclusive of ALL dogs! I wanted to create a project/movement that would paint dogs in a positive light, and create a platform to promote responsible dog ownership via creativity, art and community. The goal is simple - to find and photograph the AKC's 170+ dog breeds - both a purebred dog from a breeder and rescued dog of each breed (2 dogs/breed), living in the San Francisco Bay Area, for inclusion in a full-color coffee table book. I believe that ALL DOGS ARE A WORK OF ART, and every dog has a unique story to tell. Project DOG: SF Bay Area is a 350+ page coffee table book that features more than 170 of the American Kennel Club's dog breeds, both a purebred and rescue dog of each breed, living in the San Francisco Bay Area. Each photo is accompanied by touching stories of love, devotion and friendship, written by each dog's owner. (the AKC is not affiliated with this project). **If you have a dog and would like your dog featured on the Project DOG website, you can submit him/her HERE. I'm also still missing a few very rare breed dogs... to see a complete list of missing breeds, click HERE. **Dog from a breeder is on the left side of the page, dog from rescue organization/rehomed/found is on the right side of the page. In many cases, the "rescue" dog is purebred. *for some breeds, only 1 dog was found in the Bay Area... for these breeds, the photo will be a full spread. > Pledge $5 and sport a cool 1.5" button! > Pledge $10 and slap on a bumper sticker (appx. 3.25"x6.75")! // DONATE + DEDICATE :: YOUR DOG IN THE BOOK! > Pledge $99+ and Get Your Dog's Photo in the Book! Your generous pledge to Project DOG will not go unseen! 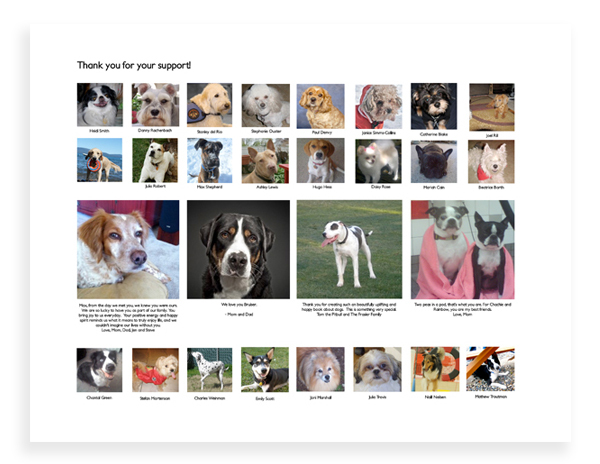 Make a $100 pledge and your name (or dog's name), along with a photo of your dog or other pet, will be listed as a supporter in this awesome book! > Pledge $250 or more ...and we'll include an even bigger photo of your dog, and little space to write something really special (100 characters). You supply the photo - photos of all animal supporters welcome. The money raised by this Kickstarter program is strictly to help fund the first print run of Project DOG: San Francisco Bay Area Edition. ...It is not cheap to print high-quality books! This book is all ready to go, all we need is some moolah to help make this dream a reality! Project DOG is not just a book, it's a movement. A movement to create a positive, open space for dog people, dog lovers and everyone new to the "dog world." I am committed to communicating and raising awareness about issues that face dogs, always in a creative, respectful, and thoughtful way... Because responsible dog ownership starts before you get a dog! Project DOG is a proud partner of The San Francisco SPCA. We are donating a portion of book sales to support the San Francisco SPCA's mission to save and protect animals, to provide care and treatment, to advocate for their welfare and to enhance the human-animal bond. San Francisco SPCA's Co-President, Jennifer Scarlett, has written the book's Foreword. Project DOG is not just any dog photography book. This book is the first of its kind - user generated content! Features both a purebred dog (from breeder) alongside a rescued/rehomed dog of the same breed, unifying all dogs. Shares dog's personal story, written by owner. Includes all kinds of dogs, including puppies, adults, senior, and disabled dogs, award-winning show dogs, therapy dogs and more! In addition to being a 350-page full color book filled with award-winning photography and captivating stories about dogs written by each dog's owner, Project DOG is about celebrating dogs - real dogs living in the world - our friends, our neighbors, our family. Project DOG has received some GREAT recognition since our launch! Kira Stackhouse featured in ScoutMob and more! Pages: 350 full color pages! Zipcar supported Project DOG in the month of June by sponsoring my travel around the Bay Area. I continue to drive Zipcars to get around to my photoshoots because I don't own a car! This project is ongoing, and I plan on publishing new versions of this book every couple years. To enter your dog for consideration, visit www.projectdog.net! ...If you've made it down this far, a sincere THANK YOU for your time and attention! Woof! THANK YOU, every dollar counts! A (1.5") "Project DOG" logo button, for your button wearing pleasure! Above + your name (or business name or organization name and website url) printed in the book as a supporter!